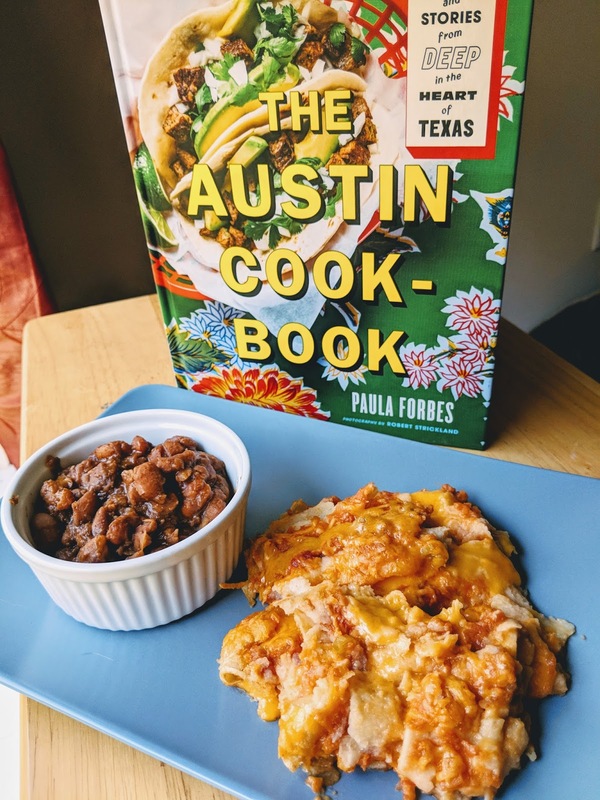 One of the cookbooks I was sent in February from the ABRAMS Dinner Party is The Austin Cookbook by Paula Forbes. I wasn't as intrigued with the baked goods as with some of the savories, so I decided to try a few dishes. I mean, this is JennyBakes, and I definitely baked these enchiladas. I made a huge pot of vegan lentil chili that was too spicy for us to eat, but I still have a sneaking suspicion that I grabbed the cayenne when I was supposed to use paprika, and you can only imagine the difference in heat that would create. Luckily my co-worker, consumer of all things spicy, took it off my hands. I also made the pimento cheese because I wanted to see how Texan pimento cheese differed from South Carolina pimento cheese, which I have been consuming ever since moving here. It was a bit spicier, not as creamy, and the green onions were a tasty addition that would be good in any pimento cheese! 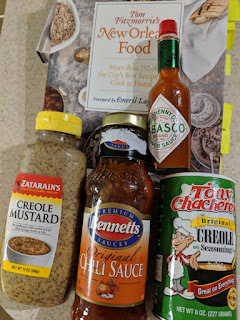 I challenged myself to make a vegetarian meal from this very meat-heavy cuisine and cookbook, so I made the ranchero sauce from the last chapter, full of pantry recipes. I replaced the chili con carne in the "chili con carne" enchiladas with ranchero sauce (the insides were always only cheese.) I made "Traditional Pinto Beans" on the stove, which take about 3-4 hours total but were super tasty, the true hero of all my experiments, and winner for recipe I'll most likely make again soon. Instead of turning them into refried beans, which was my original plan, we just ate them as is. Without the optional edition of pork, of course. Two days later, I used leftover ranchero sauce and leftover pinto beans to whip up huevos rancheros for a light supper. The recipes keep on giving! 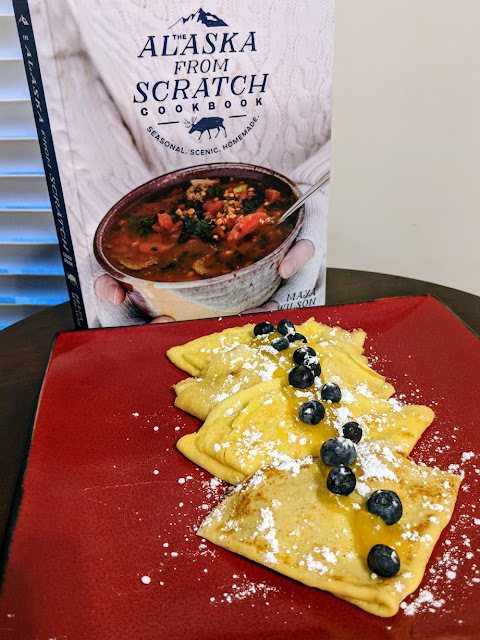 I'm still loving the Alaska from Scratch cookbook, and made another delicious treat from the breakfast section a few weeks ago. I only wish I'd taken a picture of the browned butter apple blondies I made and took on my trip with me. I will be making those and this recipe again! Peel bananas, break them up and toss them into a bowl. Mash with a potato masher (I leave some banana pieces so you get occasional nice bites of banana in the bread; don't mash until the bananas are completely liquefied). To the bananas, add the rest of the wet ingredients and stir with a wooden or plastic spoon. Add dry ingredients and stir until combined. Do not over mix. Fold in chocolate chips. Pour into prepared loaf pan and bake for 55-60 minutes or until center springs back when lightly touched. 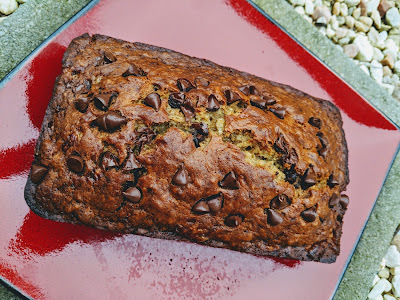 I have been a baking blogger for over 10 years. Back when I first started, I had a set of food and baking blogs I followed religiously. Since the demise of Google Reader, I've lost frequent contact with a lot of these blogs, but some I've rediscovered through Instagram. One of those is Alaska from Scratch (link to blog; link to Instagram.) I was absolutely thrilled when Maya published a cookbook, and ordered it to arrive the day it came out. I've been having a lot of fun trying recipes out from it, and haven't exhausted its possibilities yet. You may hear from it again this year. In a blender, whirl eggs, milk and sour cream together. Then add flour, salt and sugar to the blender. Whirl until completely smooth. Batter will be thin and pourable. Heat a medium-sized frying pan over medium heat. Oil the pan with about a teaspoon of oil (may need to add more later). When pan and oil are hot, pour 1/4c sized amounts of batter onto the center of the pan. Quickly but gently lift and swirl pan to spread batter to the edges. Batter should sizzle some in the oil if pan is hot enough. Cook about 60-90 seconds, until bottom begins to turn golden, then flip. Cook another 30-60 seconds until other side begins to brown. Fold in half and in half again to make a triangle. Set pancake aside and repeat with remaining batter. Serve with melted butter, powdered sugar, and lingonberry jam (with sour cream, if desired). These were delicious. The sour cream introduces a tang and a soft element that really works with a tart jam. Since what I had on hand were blueberries and lemon curd, that's what I used. Like pancakes? I seem to make them from around the world! Check out the Finnish pannukakku, Icelandic pönnukökur, Papua New Guinean banana pancakes, the Danish ebleskiver, the Hungarian palacsintas, and what we call the German oven apple pancake. I also made ratio pancakes from Michael Ruhlman's book, which we can call American. 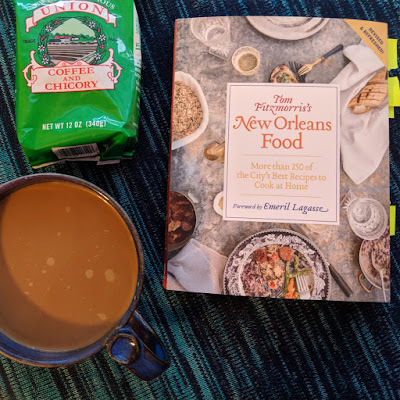 One of the cookbooks I received for the spring season of the ABRAMS Dinner Party is Tom Fitzmorris's New Orleans Food. It is the "revised and refreshed" edition, based on recipes from the best restaurants and chefs in New Orleans, intended for the home cook. For the recipes to originate in restaurants and with chefs, you'd better believe that some of them are complex and require multiple parts. Others require ingredients you may or may not be able to access if you live too far away from New Orleans. My first read through the cookbook had me ordering Tom's recommended New Orleans coffee and chicory blend from Union (via Amazon.) I set the cookbook aside until that showed up, and brewed some cafe au lait from the pages while I went through a second time. I started pining for summer, when the coastal seafood suppliers show up at my local farmers markets (4 hours inland.) I just couldn't imagine making some of the shellfish recipes with frozen or lesser ingredients than they seemed to demand. There is a heavy richness to some of these dishes, as you would find in old school New Orleans cuisine. I made the shirred eggs with crab remick for brunch this past weekend, and even leaving the bacon out, it was incredibly rich and flavorful. Even so I had to buy multiple ingredients just for the sauce that I didn't already have in my pantry. Luckily these are common enough in the south that I was able to find chili sauce, creole mustard, and salt-free creole seasoning from my local grocery store. I have a bunch of recipes marked for when I have better access to oysters and shrimp. SOON. For now, I turned my attention, as I do, to the breakfast, baked goods, and dessert sections of the cookbook. 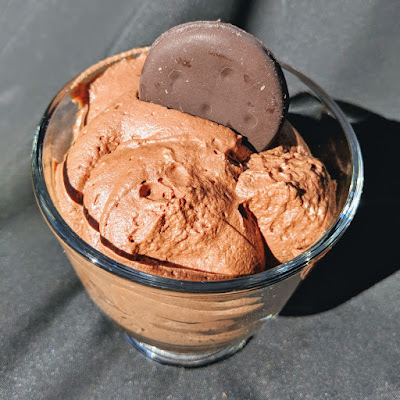 Since I was enthralled with the cafe au lait flavor, I decided to make a very traditional dessert - chocolate mousse! This recipe doesn't have a story linking it to a specific restaurant or chef, so I imagine this is Tom's recipe. 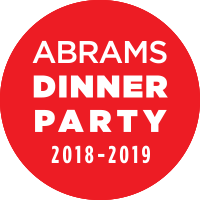 Since I didn't need to serve 6-8, I halved the recipe, and ended up very glad I did. A half recipe was almost too much for my mixing bowl when I folded ingredients together. You'd need commercial stainless steel mixing bowls for the full recipe! I am including the full recipe from the cookbook below, but it divides in half fairly easily. In another bowl, whip the egg yolks until they become distinctly lighter in color. Combine the coffee and milk, and add it slowly to the yolks, whisking as you go. Add the chocolate slowly the egg-and-coffee mixture and whisk well until the mixture is just barely warm and well blended. Beat the egg whites until soft peaks form, then add the sugar and vanilla. Continue beating until stiff. With a rubber spatula, fold the egg whites into the chocolate mixture. Do this gently; don't worry about achieving an absolutely uniform texture. Whip the heavy cream in a metal bowl. Remember that cream whips best when cold and that if you overwhip, it will break up into butter and buttermilk. If the chocolate mixture is still warm, let it continue to cool to room temperature. Then fold in the whipped cream with the rubber spatula or wooden spoon. Do this gently and keep at it until you have a uniform texture. Spoon the mousse into serving dishes or pipe it in with a pastry bag for a more elegant presentation. If you like, top it with shaved chocolate or a strawberry.